Benzene, toluene and xylene are monocyclic aromatic hydrocarbons (MAHs), used both as individual compound and as in mixtures, in various industrial and household processes across the world. Among these volatile organic compounds (VOCs), benzene is the highly toxic and well documented human carcinogen. Benzene and its derivatives (toluene or xylene) cause cellular toxicity to a non-target organism like Drosophila melanogaster, as an individual test chemical or in mixtures of two (benzene-toluene, benzene-xylene or toluene-xylene) or three (benzene-toluene-xylene). 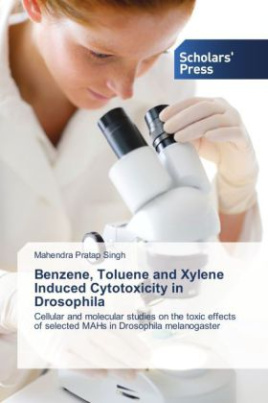 In this study various cellular, biochemical and molecular parameters were used to access benzene, toluene or xylene induced toxicity in Drosophila melanogaster at cellular level or organismal level. To the best of our knowledge this is the first comprehensive study on MAHs induced heat shock response, oxidative stress response, apoptosis, and genotoxicity in Drosophila melanogaster.